Why Buy Wholesale from Log Furniture Site? The answer is simple, you won't find better wholesale prices or higher quality rustic log furniture anywhere else. Skilled craftsmen build all our furniture by hand in our on site workshop. 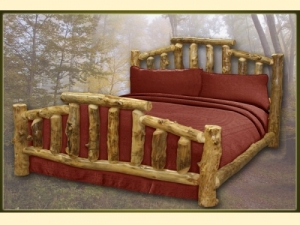 Another great benefit offered by Log Furniture Site is that you can make this furniture your own. Typically we brand our furniture with our logo so those that buy the furniture know where their quality log furniture was made. However, if you decide you'd like to sell our furniture, we can either leave our brand off or use your own customized brand. We will provide you with your own customized brand after an order of $5,000 or if you'd rather, we can let you know where this brand is made and you can provide it yourself. If you choose to provide your own brand, there is no minimum purchase required to include the brand on your furniture. We offer many different styles of furniture, but when you choose to be a vendor with Log Furniture Site your selection doesn't stop there. You have the option to design your own furniture. You can provide your own plans or let us take your ideas and draw up a plan for you. Either way our skilled craftsmen will build your quality furniture and brand it with your own individualized mark. You'll get the quality Log Furniture Site is known for published under your company's name. Please give us a call toll free at 855-LOG-SITE. We'd love to discuss becoming your vendor for quality rustic log furniture!